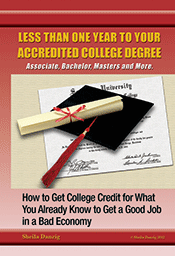 Many college programs include an internship requirement to meet the major requirements. Even if your program doesn’t require an internship, you can still get college credit for doing one. Internships also allow you to apply what you’re learning in school to the workplace environment and offers the opportunity to network professionally. Are you working through school? If you’re learning on the job, a professor with the authority to grant college credit for work experience can do just that. If you’ve already completed some college-level courses, you can still get credit for those that count towards your degree. To learn how to make your work experience, internship, and past completed education count towards your degree, visit TheCareerPeople.com.